Renowned visual artist and eponymous fragrance brand Andrea Maack today announced the launch of a new web-store on http://www.andreamaack.com and is now shipping to Belgium, Denmark, France, Germany, Ireland, Italy, Luxembourg, The Netherlands, Spain and United Kingdom. Andrea Maack unveiled a new brand identity with the release of two new fragrances, DUAL and Soft Tension. "The new look of Andrea Maack and our new fragrances represent a natural progression of the brand to complement the desires of our social media and e-commerce savvy customers," says Founder and Creative Director, Andrea Maack. Andrea Maack, the renowned visual artist and eponymous fragrance brand today announced the launch of a new web-store on http://www.andreamaack.com and unveiled a new brand identity with the release of two new fragrances, DUAL and Soft Tension. The web-store is currently available to EU customers. Collaborating with perfumer Alienor Massenet while at IFF in Paris, France, Maack and Massenet took inspiration from Maack’s upbringing and the barren Nordic landscape to deliver a forthcoming range of scents that embodies elements of Andrea's travels, artistic explorations and revisitation of her profound relationship with Iceland. The new unisex collection caters to the modern fragrance lover, whose penchant for social media and e-commerce are only matched by their desire to engage on and offline with Maack's immersive scent universe, and particularly through Instagram (@andreamaack). With these releases, Maack is introducing a new uniform, highly photogenic brand identity for the fragrance vessels. The striking black bottle and box were designed in collaboration with Maddalena Casadei at Studio Irvine in Milan, Italy, with graphic design by Tommaso Garner, who interpreted Maack’s original paintings to complete the new brand look. The Andrea Maack web-store ships to Belgium, Denmark, France, Germany, Ireland, Italy, Luxembourg, The Netherlands, Spain and United Kingdom. Additional currencies such as GBP and USD, as well as shipping to the US will be introduced in the coming weeks. Customers can also purchase DUAL and Soft Tension at Madison Ilmhús in downtown Reykjavík, Iceland or STORM in Copenhagen, Denmark. DUAL is a unisex sport fragrance inspired by the calming water of the natural hot springs in the Icelandic Highlands. DUAL mimics the feeling of fresh water on the skin and the intense color spectrum surrounding the hot spring lagoons. The powerful, uplifting aromas of ginger, lemon and pink pepper coexist with the grounded woody elements of dry amber and cedarwood, resulting in an enlivening scent experience. Soft Tension is a sensual white musk inspired by a thick mysterious fog. Like a white desert, the fog is a place to get lost in and let go. Soft Tension is a bold mix of musks combined with freesia that grounds itself in the skin. Black raw materials are mixed with white ones, such as mate absolute, cedarwood and moss, creating the soft tension. Andrea Maack will continue to introduce new, exciting fragrance and beauty essentials designed to fit effortlessly into the modern lifestyle. Maack was commissioned to explore this question with a series of scented art exhibitions worldwide. Through these exhibitions, her installations slowly morphed into her eponymous brand. 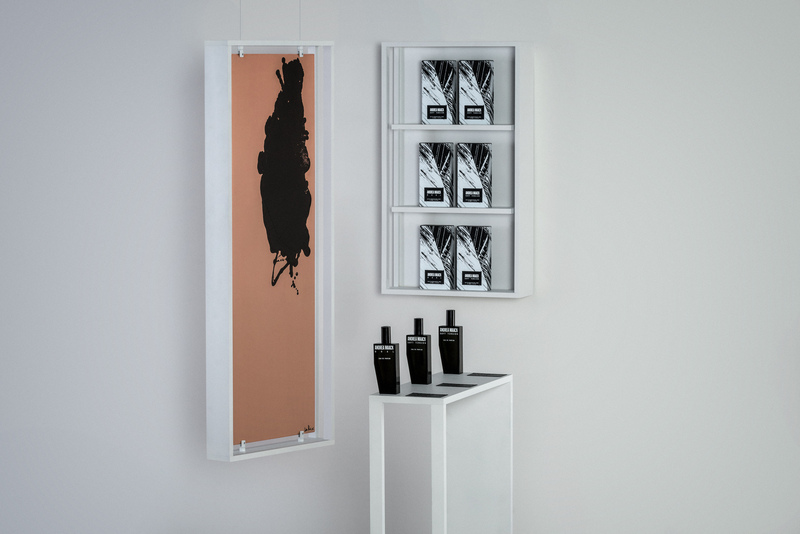 In 2011, “The Art Series” fragrances that originated in Maack’s art installations were launched internationally. The fragrances are carried by respected retailers such as Harvey Nichols, Henri Bendel, Neiman Marcus, Printemps and have been featured in prestigious fashion and art media such as Vogue, Elle, AnOther, Frame, Glamour and Marie Claire. As Maack’s brand continues to grow, she is evolving her scent universe to be social media and e-commerce focused, adding new dimensions to the fragrance experience including how she presents scents online and how the fragrances are packaged. The black bottle features elements of her own identity, with a timeless and sophisticated design that speaks to both sexes. Andrea Maack is proud to have received a marketing grant from the Icelandic Technology Development Fund. For more information, visit andreamaack.com.